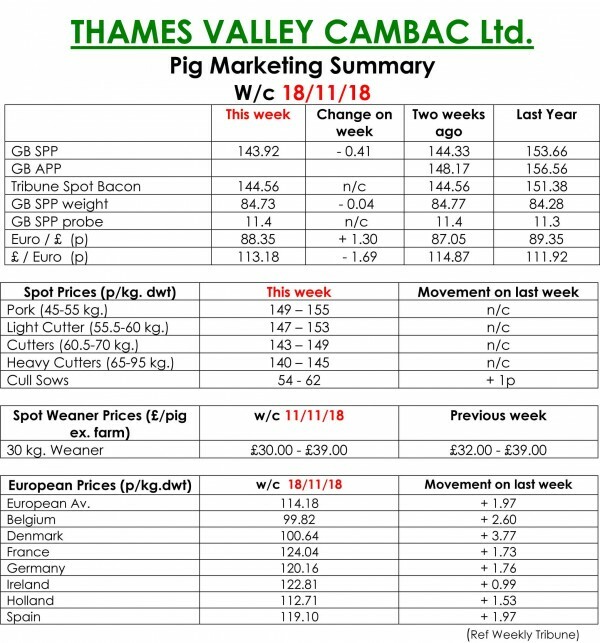 This week’s Slaughter Pig Marketing Summary from Thames Valley Cambac reported that most of the majors ramped up their throughputs this week, helped by a couple of pre-planned Saturday kills. Demand for Freedom Food pigs was particularly strong. Supply easily matched this improved demand, but average weights are remaining stubbornly high. With only five full killing weeks left before Christmas, time is running out to get on top of weights before the festive period. All contract contributions stood on for the second week running, giving an indication that trade can be done at this pricing level. The fresh meat market also saw a degree of stability creeping into trade, with prices standing on, and improved numbers in some outlets. The beneficiary of the latest Brexit turbulence was the cull sow market as a weaker pound helped prices to increase a penny. In Europe, both Denmark and Belgium registered decent rises and all quotes in sterling were further enhanced by a stronger Euro that ended the week up 1.30p at 88.35p. In the Weaner Marketing Summary, for week commencing Novemberr 11, the market continued to struggle with many fatteners short of third party fattening accommodation. Spot price quotes were very poor reflecting the low confidence in the market, and some batches remained unsold. 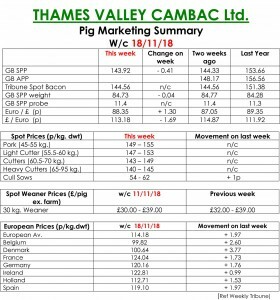 The prices announced by the AHDB saw a 30kgs pig quoted at £49.23 and the weighted average for a 7kg rise by £1.38 to £37.05.